DO YOU WANT, THAT THE TRAINER CAN OBSERVE YOUR RESULTS? Just follow the steps below to take advantage of the features of the AiCOACH System! What do you need? AiCOACH vest, a phone connected to the Internet that meets the required minimum specification with installed AiCOACH Teams and AiCOACH Tracker apps. 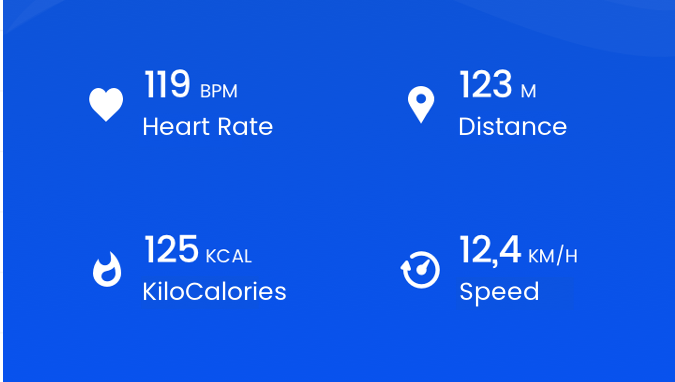 It should also have a heart rate monitor or other sensors connected to the phone via Bluetooth or ANT +. HOW TO START WORKING WITH THE AiCOACH SYSTEM? 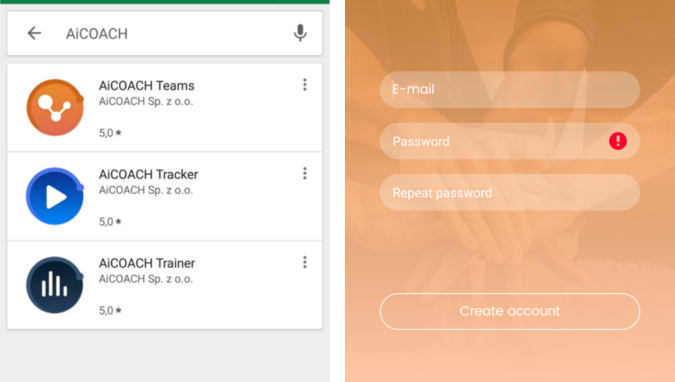 Download AiCOACH Teams and AiCOACH Trainer apps from the Google Play Store. Go to the Google Play Store app and enter the “AiCOACH” in the app search engine. Next install the AiCOACH Teams and AiCOACH Tracker. 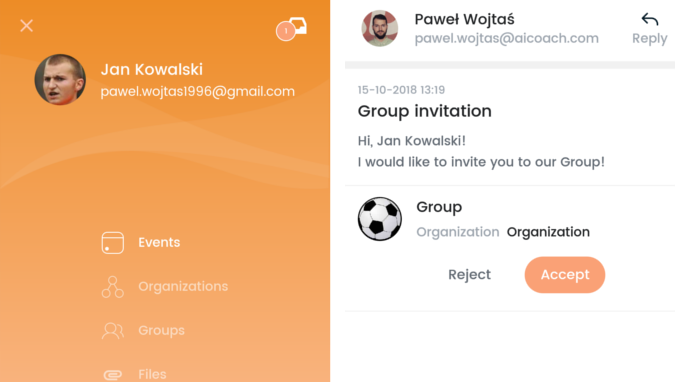 Launch the AiCOACH Teams app, create your account and accept the invitation from the Coach to the group, which you will find in your inbox. Remember also to buy subscription for AiCOACH Teams and AiCOACH Tracker apps. You can decide, for what time you want to buy your subscription - you can also use discount codes! Start the AiCOACH Tracker app, agree to the use of sensors, GPS and other data by the application and buy a subscription for the AiCOACH Tracker app. Expand the navigator menu by clicking on the three horizontal lines in the upper left corner, go to the "Settings" and the "Account" tab and complete your profile correctly. Fill out your full name, enter the correct date of birth, weight, height and maximum speed of the run. 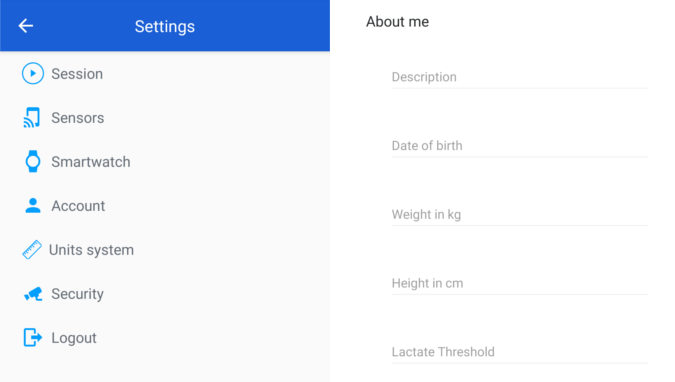 The heart rate thresholds will be calculated automatically after giving your date of birth and gender - complete the rest of the data in consultation with the trainer. After entering all the data, click on the confirmation mark in the upper right corner. 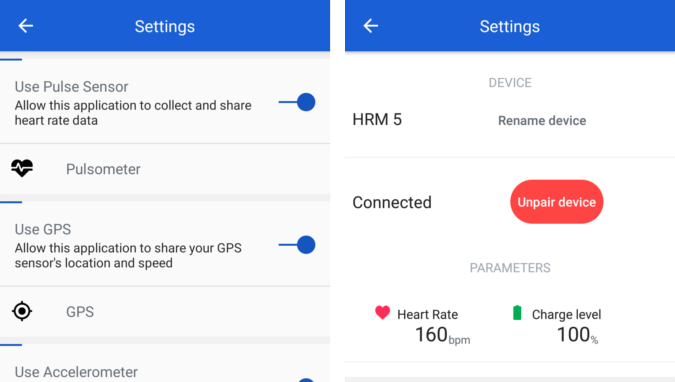 Connect (pair) the heart rate bar to your phone. You can do it inside the AiCOACH Tracker app - go to the "Settings", then click "Sensors" and next "Heart rate sensor". Just put your heart rate monitor on your body and click on the "Pair" button then choose your device from the list. Before the upcoming training, put on the AiCOACH vest, start the AiCOACH Tracker application on your phone and put on your heart rate monitor. All you need to do is open the AiCOACH Tracker app. Your phone needs to be connected with the Internet, Bluetooth turned on and battery saving turned off for AiCOACH apps. Put the phone in the vest (so that the screen is facing your back) and start training. If you don’t have a vest, you can put the phone in your kidneys or anywhere else, but then any variables related to postural defects, overloads, direction of movement and many others may be inaccurate. After the training, start the AiCOACH Tracker app, expand the menu tab by clicking on the three horizontal lines in the upper left corner and select the "Sessions" tab. 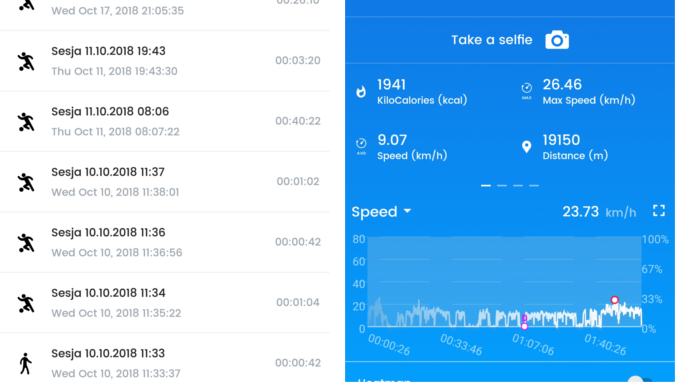 Choose your last workout from the "Remote Sessions" tab and analyze your results then take a selfie where you can show your training parameters! WHAT PHONE WILL MEET THE REQUIREMENTS OF THE AiCOACH SYSTEM? Players must to have smartphones with the Android operating system recommended in version 6.0 or higher (version 5.0 is also supported) - the version for devices with the iOS system is under construction. The phone should be equipped with at least 1 GB of RAM, a 4-core processor and a minimum of 6 GB of free internal memory. If you want to make full use of the AiCOACH system functionality, the phone should also have a SIM card with an internet package or access to Wi-Fi, GPS, gyroscope, pedometer, accelerometer, magnetometer, camera, Bluetooth 4.0 + LE. The phone can collect the same data range as in the case of dedicated sensors proposed by competing companies and they are often even more accurate, because the components used in phones are of higher quality. External and internal phone failures can cause the application to malfunction. Does the phone have a charged battery? Does the phone have enough internet data package (does the internet work)? Does the phone have a location service turned on? Does the phone have the battery saving option turned off for the aicoach tracker app? Does the phone have bluetooth enabled? Does the phone have turned on aicoach tracker app? Does the heart rate monitor or other external sensors are connected with the phone?